The British panorama of the 1960s was photographed by a young worldly gentleman who worked as a photojournalist for Tatler Magazine. As the cultural movements of the 60s swung through Britain the royalty subverted to the new order of the rebels. Photographer Philip Townsend was there to record the British icons of music, art and fashion. The good, the bad, and the beautiful passed in front of Philip’s camera: Twiggy, the ingénue who broke the mold on the fashion figure, Nico, the princess of the rebel rockers, and Warhol’s chic mascot, The Beatles in their first meeting with the Maharishi, and the street fighting Rolling Stones, in their first photo session. 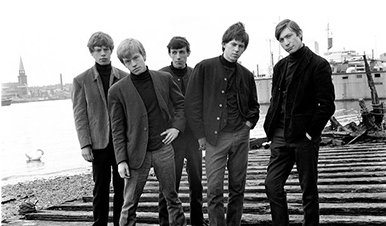 The Rolling Stones photographs underscore the bad boys of London before they were a “big bang.” Philip was introduced to the group by legendary manager Andrew Loog Oldham and the friendship continues today. The new order of aristocrats was spearheaded by the Beatles and the Rolling Stones. In their footsteps followed a parade of bands we still listen to today, some of whom are making a comeback. When the swing of London dissolved in the 70s, Philip closed the lens of his camera and financed a series of creative projects. Then in 2004, encouraged by compadres and friends, Philip regained an interest in his archives. Retaining the copyright to all his work, Philip brought his portfolio to the attention of London’s galleries, and the exhibitions followed. Philip’s photographs are archived in the Victoria & Albert Museum, the National Portrait Gallery, and the National Library of Wales.